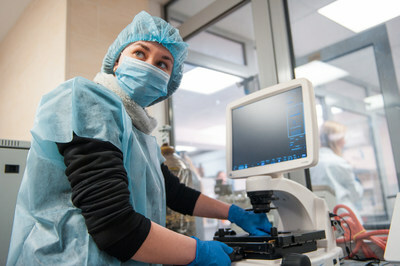 A research group consisting of scientists from NUST MISIS, the Technical University of Munich, Helmholtz Zentrum Mü nchen, the University of Duisburg-Essen, and the University of Oldenburg have developed a system that allows doctors to both improve the accuracy of diagnosing malignant cells and to provide additional opportunities for cancer treatment. The m agnetoferritin compound is the main element of the new system. The research article has been published in Advanced Functional Materials. The lack of accuracy ('contrast') in imaging is a common problem of non-invasive diagnosis. 'Contrast agents', compounds that are introduced into the body before a diagnosis procedure to enhance the response and make affected cells more visible on a tomograph, can be used to solve this problem in magnetic resonance imaging (MRI). Paramagnetic gadolinium particles and superparamagnetic iron particles are among these agents. However, even in small quantities, these substances - alien to the human body - can potentially be dangerous.
" The international research team, including Dr. Ulf Wiedwald, a visiting Professor at the NUST MISIS Biomedical Nanomaterials Laboratory, has developed a unique injection diagnosis system based on magnetoferritin. The developed system will significantly improve the quality of MRI s and optical diagnosis , " - said Alevtina Chernikova, Rector of NUST MISIS.
" An intrav enous injection of magnetoferritin has been proposed. Then, spreading with the blood flow, [the magnetoferritin] will be captured by the targeted tumor cells. As has been shown in a large number of studies, these cells actively capture transferrin - the protein responsible for the transport of iron in the blood. The same receptors are capable of capturing the magnetoferritin as well. Once they get into the lysosomes of target ed cells, the magnetoferritin will further enhance the contrast signal , " -commented Dr. Wiedwald. The system will also allow doctors to conduct therapy on tumor formations. If an MRI shows cancerous cells, they can be targeted by an electromagnetic field or light, which will lead to their heating and subsequent death.